Tony and Elizabeth Jordan have it all-great jobs, a beautiful daughter, and their dream house. But appearances can be deceiving. Tony and Elizabeth Jordan’s world is actually crumbling under the strain of a failing marriage. While Tony basks in his professional success and flirts with temptation, Elizabeth resigns herself to increasing bitterness. But their lives take an unexpected turn when Elizabeth meets her newest client, Miss Clara, and is challenged to establish a “war room” and a battle plan of prayer for her family. As Elizabeth tries to fight for her family, Tony’s hidden struggles come to light. Tony must decide if he will make amends to his family and prove Miss Clara’s wisdom that victories don’t come by accident. Source: Rotten Tomatoes. Photo Source: The Guardian. Starring: Priscilla C. Shirer (Elizabeth Jordan), T.C. Stallings (Tony Jordan), Karen Abercrombie (Miss Clara), Tenae Downing (Veronica Drake), Alena Pitts (Danielle Jordan). Directed By: Alex Kendrick. Written By: Alex Kendrick, Stephen Kendrick. Rating: PG; Runtime: 120 mins. Variety: Outside of evangelical circles, the names Alex Kendrick and Stephen Kendrick are likely to be met with blank stares. But thanks to low-budget hits like Fireproof and Courageous, the brothers have transformed themselves into Steven Spielbergs of Christian cinema. This drawing power was firmly on display when War Room, a celebration of the purpose-driven life, stunned box office watchers by nearly dethroning Straight Outta Compton as the weekend’s highest-grossing domestic release with its $11 million debut. That’s particularly impressive given that the religious drama was playing on a third of the number of screens as the N.W.A biopic. Alex Kendrick, a former pastor who handles directing duties on the brothers’ films, said “Critics in Hollywood are rough with us. They don’t understand why we make our movies or our worldview. But our target audience gets them and that’s who we want to draw closer to a walk with God.” See full article at Variety. See full review at The Wrap. 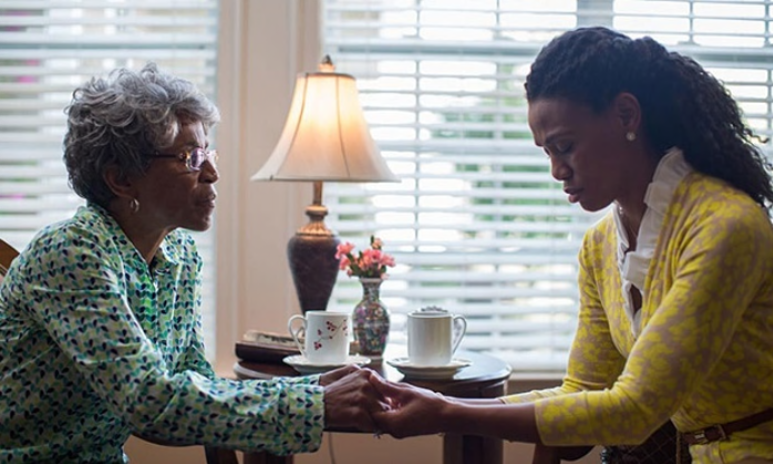 The Guardian: War Room, is, unfortunately, nowhere near as entertaining as some other of the recent low budget evangelical Christian films. The performers are professional and, while it’s set in dull interiors with flat TV lighting, it cuts together okay. The plot is an uninteresting melodrama with a tortoise’s pace, but this does allow the viewer plenty of time to scrutinize its odd logic. Elizabeth (Priscilla Shirer, a successful Christian minister in her first film role) is a hard-working real estate agent aware that her marriage is almost at its breaking point. Her no-nonsense new client Miss Clara (Karen Abercrombie) wants to talk less about selling her house and more about Elizabeth’s relationship with Jesus. Miss Clara explains how she found happiness. She turned her walk-in closet into a war room, and there she sat and prayed and prayed. After a lengthy period of consideration, Elizabeth follows suit. It was good timing, too, as her no-good husband Tony (T.C. Stallings) was just about to shack up with a work associate. Shirer and Stallings do the best they can with the material, and while Miss Clara is about as subtle as Tyler Perry’s Madea, Karen Abercrombie’s furniture-chomping performance does sneak a laugh or two. See full review at The Guardian. The Christian Broadcasting Network: War Room is a movie that serves as a powerful reminder of the impact that prayer can have on our everyday lives. It is a poignant example of God’s willingness to extend grace and mercy to us even when we feel like we don’t deserve it. Faith, family, and the power of prayer on the big screen … well worth the price of admission. See full review at CBN.com.